The Qualification Tournaments for women and men were drawn on Monday 27 June 2011. 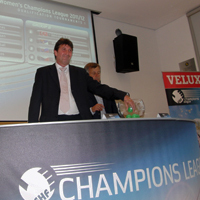 The draw for the Qualification Tournaments of the VELUX EHF Champions League and the EHF Women’s Champions League and took place in Vienna on Monday 27 June 2011. The teams of Group A and Group B will meet in two tournaments on 02/03/04 September 2011. Each team will face every other group opponent once, and after three matches per team the winners and the runners-up of the two groups go through to the next stage of the EHF Women’s Champions League. The four losers of the tournaments go to Cup Winners’ Cup, where they enter Round 2. A separate draw gave Ormi-Loux Patras (GRE) in Group A and Üsküdar Belediyesi (TUR) in Group B the first right to organise the tournament. If not utilized, the right to organise the tournament of Group A would pass down in the order LC Brühl Handball (SUI), MizuWaAi Dalfsen (NED) and Gil Eanes-Lagos (POR), the right to organise the tournament of Group B would pass down in the order IUVENTA Michalovce (SVK), RK Zajecar (SRB) and HC Britterm Veseli (CZE). Find all information on the 2010/11 EHF Women’s Champions League Qualification 1 here. The teams of Group 1 – 4 will meet in four tournaments with four teams each on 17/18 September 2011. These tournaments will be played in a final four format – with two semi-finals on the first day and the 3/4 placement match and the final on the second day. Only the four winners go through to the Group Matches stage of the EHF Women’s Champions League (see further down). The four teams finishing fourth in Qualification Tournaments 2 continue in the Cup Winners’ Cup, where they enter in Round 2. The teams ranked second and third also go to the Cup Winners’ Cup, but enter Round 3. A separate draw gave Viborg HK (DEN) the first right to organise the tournament in Group 1. If not utilized, the right to organise the tournament of Group 1 would pass down in the order Winner Qualification Tournaments 1 – Group B, Rostov Don (RUS) and Univ. Jolidon Cluj (ROU). A separate draw gave KGHM Metraco Zaglebie Lubin (POL) the first right to organise the tournament in Group 3. If not utilized, the right to organise the tournament of Group 3 would pass down in the order Runner-up Qualification Tournaments 1 – Group A, Buxtehuder SV (GER) and DVSC-Forum Debrecen (HUN). A separate draw gave IK Sävehof (SWE) the first right to organise the tournament in Group 4. If not utilized, the right to organise the tournament of Group 4 would pass down in the order Winner Qualification Tournaments 1 – Group A, Tertnes Bergen (NOR) and Randers HK (DEN). Find all information on the 2010/11 EHF Women’s Champions League Qualification 2 here. The teams of the VELUX EHF Champions League Qualification groups will meet in three Qualification Tournaments on 03/04 September 2011. The matches of the groups will be played in a final four format – with two semi-finals on the first day and the 3/4 placement match and the final on the second day. Only the three winners go through to the Group Phase stage of the VELUX EHF Champions League. The teams finishing fourth in the Qualification Tournaments and the Wild Card Tournament continue in the EHF Cup, where they enter in Round 2. The teams ranked second and third in the four tournaments also go to the EHF Cup, but enter Round 3. A separate draw gave Tatran Presov (SVK) the first right to organise the tournament in Group 1. If not utilized, the right to organise the tournament of Group 1 would pass down in the order RK Partizan Beograd (SRB), AEK Athens (GRE) and FC Porto Vitalis (POR). A separate draw gave Besiktas JK (TUR) the first right to organise the tournament in Group 2. If not utilized, the right to organise the tournament of Group 2 would pass down in the order IK Sävehof (SWE), aon Fivers (AUT) and Dinamo-Minsk (BLR). A separate draw gave Maccabi Srugo Rishon Lezion (ISR) the first right to organise the tournament in Group 3. If not utilized, the right to organise the tournament of Group 3 would pass down in the order HC Metalurg (MKD), Haslum HK (NOR) and FH Hafnarfjördur (ISL). Find all information on the 2010/11 VELUX EHF Men’s Champions League Qualification here. Find more information on the Wild Card Tournament here.